Fully programmable data converter for access systems, with an internal relay. 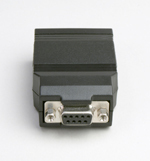 The 716R converter is a user programmable converter which will convert any of the following input data formats to rs232: magnetic stripe (tracks 1 & 2), wiegand (standard, alphanumeric, and aba weigand). Up to 250 bits of data can be read. The converter can also dump wiegand and magstripe data bits to the rs232 port. The 716R also contains an internal relay, which can be operated serially by sending commands to the converter.Â The 716R does not have to be used as a data converter, It can be used solely as a serial controlled relay if needed.